Reselling: Companion Pass Edition – Subscriber only post. You can subscribe to the newsletter here. Reselling is by far the best way to add legitimate spending onto your credit cards without losing money, however, it’s not risk free. This post is designed to inform and provide my insight into the world of reselling. I take no responsibility for anything that may or may not happen, positive or negative, from following the ideas and directions in this post. 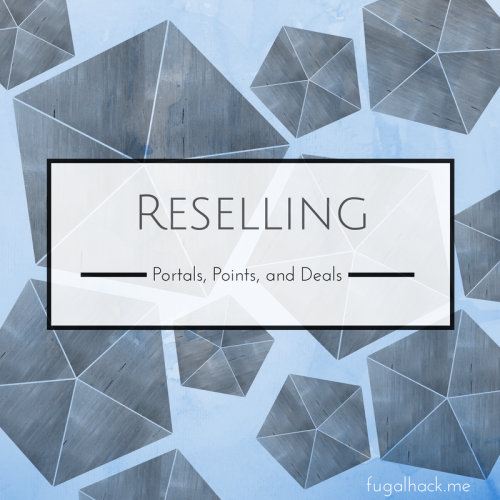 I’ve talked about portals before, but they’re worth mentioning again, particularly in the context of reselling. 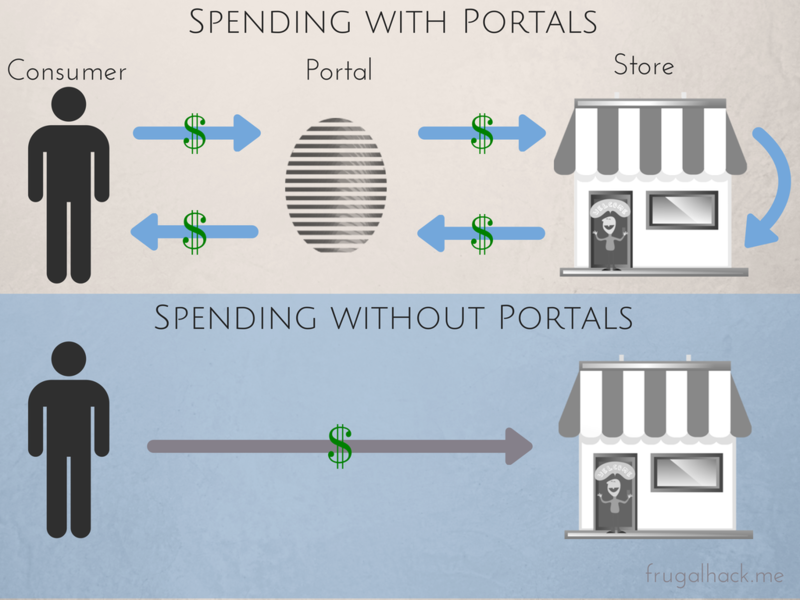 If you’re new to the concept of portals, they’re basically referral links for retailers. You click-through these portal links to visit a retailer and they compensate you with a percentage of your purchase, points, or miles, depending on which portal you use. You should ALWAYS use a portal whether you’re reselling, manufactured spending, or simply doing some regular shopping. They cost you nothing and they only require one extra click before completing your purchase, so there’s absolutely no reason you shouldn’t use them. In terms of reselling, portals can be the difference between profitable and unprofitable. Hopefully, that isn’t the case for most of your items, but in certain situations (see Reselling: Companion Pass Edition above) it can be. You have three options: points, miles, or cash back. Most of the time, cash back will offer the highest return, but depending on how you value certain points and mile, it may be more worthwhile to use a non cash back portal. For example, see below. At the time of this post Shop Discover was offering 10% cash back at Kohls, while the highest point and mile offerings were capped at 3 per dollar. In that case, I would choose to use Shop Discover, since I value 10 cents per dollar higher than I value 3 points per dollar at any of the travel partners listed above. That will vary from person to person, so it’s ultimately up to you. If you value Marriott points higher than 3.33 cents each, then you should definitely use Marriott portal. If you don’t have a Discover card then that portal is off-limits, which means the next highest cash back portal is only 8%. In that case, you would need to value Marriott points at 2.66 cents each for that portal to be more valuable than the cash back portal. As you can see, there’s no right or wrong portal to use as long as you actually use one. I will use the portal that I value most or the portal that has given me the least amount of trouble. UPromise – This portal is almost always one of the top cash back portals available, which makes it a top pick in my book. Also, I have never had an order not track through UPromise. Shop Discover – Shop Discover is similar to UPromise in the sense that it is almost always one of the top cash back portals available. I love Discover cash back, because you can use it to buy gift cards for less than their face value. However, I have had instances where I’ve used different credit cards with Shop Discover and my orders did not track. This didn’t used to be the case, but it seems they’ve upgraded their portal. Tread carefully if you use Shop Discover with a different credit card than a Discover card. Ultimate Rewards Shopping Mall – I love UR points, so I will commonly use this portal if I have an upcoming trip or it’s close to the same as a cash back portal. I tend to value UR points at 1.6 cents a piece. Southwest Rapid Rewards Shopping – If you read the companion pass reselling post, then you know I love this portal. They commonly run great promotions where you can earn a lot of points! 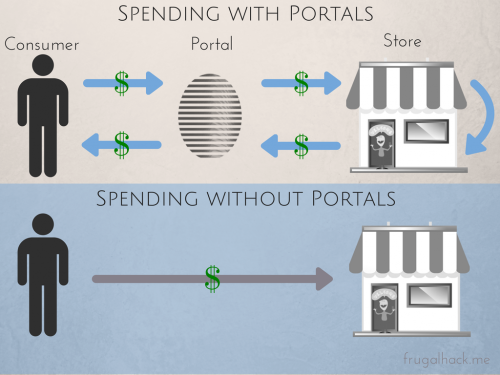 You should sign-up for a lot of portals, but try not to spread your cash back to thin. Most portals have a certain threshold that they pay out at. So, if your cash back is spread out between too many portals, it will take a long time for the payouts to occur. If you want to sign-up for any portals referral links, you can do so here. You don’t have to use my links, but I sincerely appreciate when you do! Always check CashBackMonitor before choosing what portal to use. Portals adjust their payout amounts regularly. You don’t want to miss a big portal bonus do you? Make sure you read the terms of the portal before clicking through. If the highest paying portal available specifically excludes the item you plan to purchase, you might want to find a different lower paying portal that is guaranteed to track. Check Frequent Miler’s Lab when you want to check if a portal will track when doing something that goes against the terms of the portal. Many people contribute to this list, so it’s likely someone has tried and has a data point you can look at. If you read this blog, chances are you use your credit card for everything. That’s great, as long as you never pay interest (Rule #11)! However, are you making sure you use the credit card that earns you the most points and miles on your purchase? Sometimes rewards structures change, you forget about a certain credit card’s rewards, or you just have so many that it’s hard to keep track of them all. Whatever the case may be, I suggest you use Wallaby. It’s a completely free app that will tell you which of your cards earns the highest amount of rewards at a specific retailer. It only takes a few minutes to set up and can completely change the way you keep track of your cards. I love it! Not only do credit cards offer rewards, but they also offer many great perks that often get overlooked. For example, many great cards (e.g. Discover It) offer price protection, which will refund you the difference if you find the exact same item you purchased at a lower price. This is extremely useful when reselling. Discover offers this service for 90 days after you purchase the item. That’s a long time. The best part is you can sell the item and still price match it (within the 90 days) as long as you have the receipt for the item. Certain store credit cards are worth having when reselling product. As an example, I recently signed-up for a Kohl’s Charge Card, because it gives my 30% off storewide at least 12x per year. I love reselling Kohl’s product because of those coupons. Another example is Best Buy. For one month straight, Best Buy offered 10% back in rewards points when you used your Best Buy credit card. That can turn into a lot of money very fast when you are reselling! Deals are great. In fact, without them reselling would be impossible. If you haven’t already, I suggest checking out this post on where to find the best deals. I go much more in-depth in that post than I will on this one. The deals never stop flowing on those three sites, so I highly suggest checking them out regularly. The only problem is that many other resellers often visit those sites as well, so your competition will likely be high if you choose to source those deals. I talked about identifying deals in my Sourcing and Selling posts, but here’s a quick recap. Let’s say you found an item selling for $100. First, you want to check the marketplace you plan to sell the item at. How much do they have the item priced for? Is there a lot of competition? If the item is priced for a decent amount, let’s say $150 for this example, and there’s not a lot of competition, great! Now, check if it’s selling. If the item has zero competition and it’s priced significantly higher than the store you plan to buy it from, that might be a sign that the product is not selling. If it seems to be selling congratulations, you identified a deal worth reselling! Gift cards can help your margins a lot when you can get them at a fraction of the cost. Check Gift Card Granny to see what gift card marketplace will give you the highest percentage off for the retailer of your choice. If you find the right gift card marketplace, you can even double dip or triple dip with a portal. Besides portals and deals, store reward programs are the best pay to increase your margins when reselling. Before I started reselling, I wouldn’t bother signing up for store reward programs, because I never shopped at a single store enough. Now, I spend thousands of dollars across multiple stores in a months time, which means those rewards add up quick! Staples Rewards – You earn 2% back in rewards on every purchase when you’re a base member, 3% when your plus, and 5% when your Premier. Once you become a plus/premier member you can also recycle more ink (20 per month which equals $40 in rewards per month if you max it out). Check out this post to learn more about Stapling. My Best Buy – You get rewards points on every purchase. If you have an elite or elite plus account you earn more rewards points per dollar. You also have longer to return your product, when you are an elite/elite plus. Shop Your Way Rewards – Sears and Kmart often run promotions where you can purchase an item and get that item’s price back in points. So, if you value SYWR points like you value cash (which you should) it’s like getting a free item. In the reselling world, that’s awesome! Rewards R Us – I don’t shop at Toys R Us very often, but for many resellers, it’s the store of choice. Their reward program gives you a $5 reward certificate for every $150 spent at Toys R Us and Babies R Us. mPerks – Meijer is a regional grocery store that has a very generous rewards program for resellers. They often have rewards such as, “Spend $200 this month and earn $25 off your next purchase.” If you find sellable items in clearance or on sale, it’s easy to rack up your spending at Meijer. I’m sure there are more rewards programs I’m missing, but the idea stays the same: Sign-up for every single one. Even if you don’t source from that store very much right now, there’s a chance that you will in the future and it won’t hurt to have some rewards/perks waiting for you. What is your favorite rewards program?